Laser Hair Removal (LHR) has now become a common every day word. 20 years ago, back in 1999 when Silk Touch first introduced Laser Hair Removal, we were met with skepticism and disbelief. "You mean you can really get rid of hair permanently?" The answer to that question is a resounding YES. Laser Hair Removal works. Thousands of clients have had the satisfaction of never having to shave again. Myth #1: Laser Hair Removal is completely permanent, FOREVER. Answer: Yes and No. The FDA prohibits the advertisement of FDA-approved laser treatments to be described as a method of “permanent hair removal”. Hence, use of the term “permanent hair reduction” is used to describe the procedure. In reality, many clients never have to shave again in certain areas of the body. I had LHR 12 years ago on my legs, bikini line and underarms. I DO not have to shave my underarms or bikini line, but there are finer blond leg left over from treatment years ago that I have to shave every few months. Myth #2: All Hair types can be treated. Answer: No, not as effectively as dark haired individuals. Today, most lasers target Melanin. Melanin gives colour to both hair and skin. Since the dark matter in hair follicles are the target, this procedure is best suited for dark haired individuals. Myth #3: Laser Hair Removal is painless. Answer: We all wish that were the case, but the fact is....even with lasers that add coolant or gel, it can be a little uncomfortable. Look for a doctor who provides a topical anesthetic in additon to the coolant that the laser provides. A machine called a Zimmer can help to cool the area and make this treatment much more comfortable. Myth #4: Once gone, my hair will never grow back. Answer: For many, the hair never grows back. Hair on the face (especially for women) can grow back or be difficult to get rid of in the first place. Hormones, heredity and other factors can play a role in the permanent reduction of hair. Hair treated with the laser will often grow back lighter, finer, and more sparse. LHR treatments can delay growth. Many clients need maintenance treatments on their face every year or two to keep hair at bay. This can still be a much better option than the cost of waxing every few weeks. Touch-ups if needed, are always offered at a much lower price. 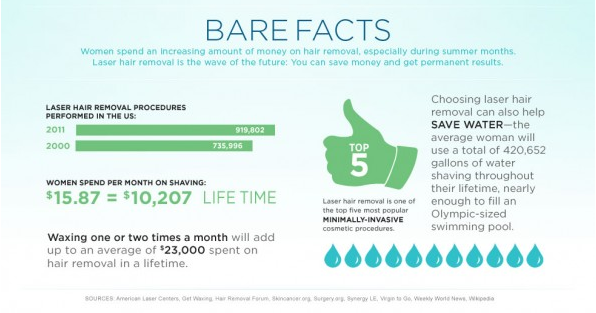 Myth #5: Laser Hair Removal is expensive. Answer: Compared to what? Shaving everyday? Buying new razors & shaving cream every month? Waxing? Over time, Laser Hair Removal is much more cost effective than other procedures. Your time alone is worth something. If you shaved 10 min. a day (that's pretty conservative) for 10 years you will have spent 304 hours shaving! And that doesn't count the cost of razors, shaving cream or the price of waxing. Treatments can start at $50 an area to several hundred for larger areas. Just take a look at the infographic below to see how much you could save in a lifetime. 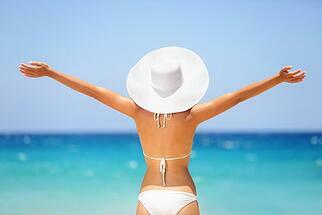 Right now save 50% on any Bikini or Underarm Laser Hair Package - Click for details! Lately there has been a lot of buzz around this injectable treatment from the makers of Botox, Kybella. And it's easy to see why. 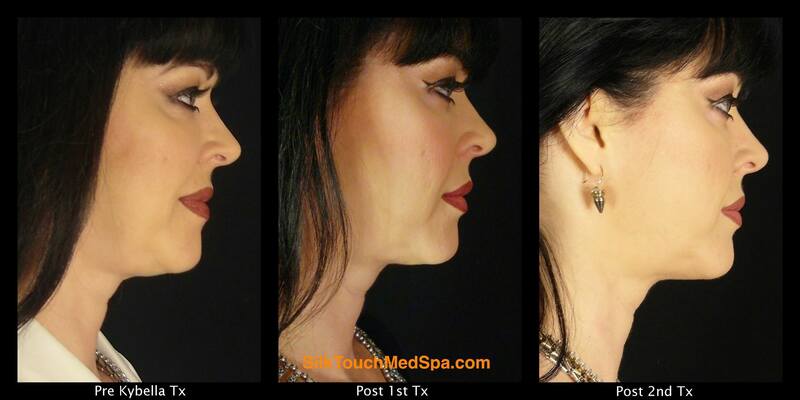 It's an amazing treatment that gets some pretty wow worthy results for jawline contouring. Kybella is the first and only FDA approved injectable treatment that gets rid of under-the-chin fat permanently with out surgery! The treatment takes about 15 minutes and while there is some slight tenderness and swelling, the downtime is very minimal. We have been using Kybella in our practice for a few years now and we can't get enough of this product! Not only can you use Kybella under your chin and in your jawline - but you can also use it on other areas of the body such as bra fat and banana rolls. Are you a candidate for a Kybella double chin treatment? While we want to evaluate you in person first before we can say 100%... you can use this easy test to get a good idea! 1. Pinch the skin under your chin, then pinch the skin on your wrist - if it feels the same, then you a probably not a candidate. 3.Pinch the skin under your chin, then pinch the skin on your flanks (love handles). If it feels the same, then you are probably a candidate! 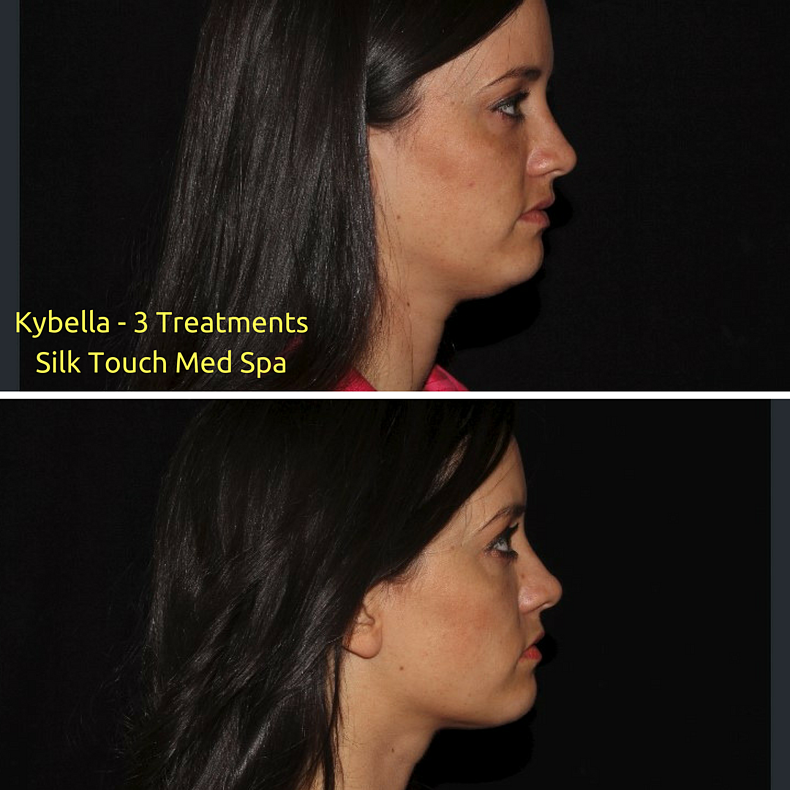 Check out some of our favorite Kybella before and after pictures below. PRP is the latest buzzworthy beauty treatment - and it's all over social media. The Kardashian's love it, Angelina Jolie can't stop talking about it and bloggers everywhere are singing its praises. So what's the big deal? PRP stands for Platelet Rich Plasma, and when it comes to anti-aging benefits, you can think of it as liquid gold. Like many aesthetic treatments - PRP was first used in the medical community. It is found in our blood, and the healing properties originated from research in wound healing and orthopedic research. The treatment involves a technician drawing about 10mL of blood, centrifuging it to concentrate the blood plasma (the pale-yellow liquid component of blood that normally holds the blood cells in suspension) into a gel-like substance, then using it in an aesthetic treatment. The PRP jumpstarts your body’s healing mechanisms to stimulate skin recovery. There’s virtually no chance that your body will reject or react negatively to the injection, because it immediately recognizes the substance as its own cells. PRP Injections: stand-alone treatments for the face. It helps stimulates new collagen, enhances microcirculation and regrowth of new healthy skin. The growth factors start working immediately, and the injected platelets are activated and release additional growth factors that accelerates the desired effects. It can take a few weeks to months to start seeing results, but they are extremely natural looking. PRP with Injectable Fillers: This is one of the most popular methods, combining the volume replacement of injectable fillers with the skin-enhancing qualities of PRP. By directly injecting the PRP with the fillers, the full benefit of the PRP is delivered directly where it produces the maximal benefits. PRP + Microneedling: also known as collagen induction therapy, or a Vampire facial, microneedling is a minimally invasive skin rejuvenation procedure using a device that contains fine needles. The SkinPen is programmable to puncture the skin thousands of times per minute in a highly controlled fashion – each puncture creates a micro channel that triggers the body to produce collagen and elastin to fill the channels. PRP + Hair Restoration - PRP can also be injected into the scalp to help thicken the hair and repair the hair's natural growth process. It is also used during our NeoGraft Hair Restoration surgery cases. Scientific studies dating back three decades have documented that PRP stimulates new collagen growth and can soften or even eliminate the visible effects of sun damage and aging in your skin. Wrinkles are diminished, scarring minimized, hollows plumped and skin texture smoothed. Most patients see an immediate improvement in their complexion and skin condition. But because the full, natural healing process takes time, results will appear gradually and progressively over a four to six week period. Are you ready to see if PRP is the right treatment for you? Schedule a free consultation today! Many people try for months or even years to get more toned and contoured arms - but still the fat won't budge. Even people who are working out and doing everything possible to shape the arms can sometimes fail to get the results they want. Blame stubborn fat or even bad genetics - sometimes working out just won't get you the desired results you want. Unfortunately, some fat is just diet and exercise resistant. 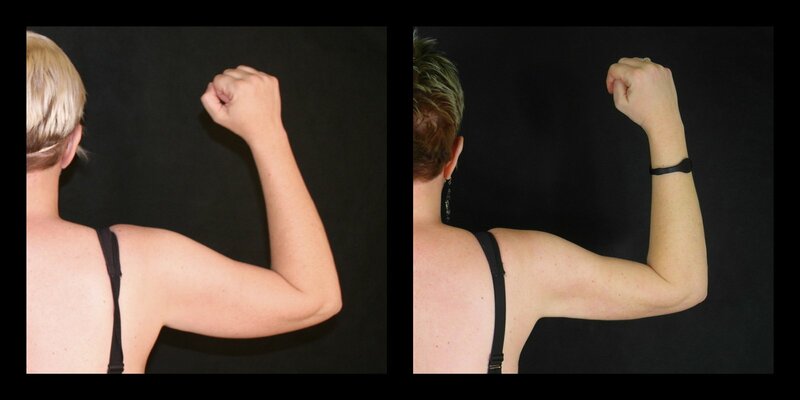 Fortunately, Arm LipoSculpture or Arm Liposuction can help you get that toned, contoured look of well-shaped arms. It can remove the fat that is not responding to other methods. Dr. Brian Kerr of Silk Touch Med Spa, Laser & Lipo Center has performed hundreds of arm liposuction procedures with amazing results. - Get rid of fat deposits located on the chest "bra fat"
Arm Liposuction is a one-day procedure that takes less than a few hours. Most patients are back to work in just a few days, and garments are worn for a limited amount of time to help with the healing process and further toning the arms. If loose skin is also an issue, arm liposuction can be paired with skin tightening treatments such as ThermiTight (which can be done on the same day) or a series of Non-Surgical Venus Freeze Skin Tightening Treatments post-procedure. If you have fat you can pinch on your arms or bra area - then most likely you are a candidate. 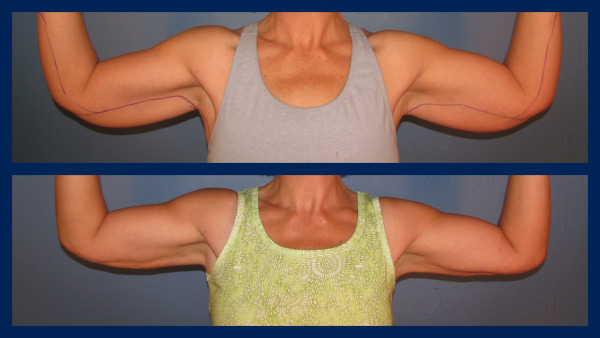 While arm liposuction is permanent, fat can return if you continue gaining weight. Are you a candidate? Schedule Your Free Consultation at Silk Touch Med Spa. During this free consultation we can go over your goals, give you an exact price for how much your treatment will cost, financing options and any other questions you may have about the procedure. SEE OUR CURRENT LIPOSUCTION SPECIALS HERE. Knowledge Is Power. 5 Questions You Should Ask At Your Consultation. Knowledge is power. With it we can make informed decisions that are right for us. Without it we are at the mercy of advertising slogans, Google searches and corporate spin. How can we possibly disseminate and find the nuggets of real information from the fluff designed to wet our appetites? The answer is in talking to the right people who have the right information to answer the questions that you have. That is why at Silk Touch Med Spa we provide complimentary consultations. The purpose is for clients to come in and discuss procedures, ask questions and most of all determine if what you’re looking at it really the best option. At Silk Touch we are not salespeople, we are educators who love to share product and procedure knowledge with our customers. We take the extra time to make sure all questions are answered and all avenues thoroughly explored before making recommendations. While there are no wrong questions to ask at a cosmetic surgery consultation, there are some key questions that you should include on your list when meeting with aesthetic providers. 1. Who will be performing the treatment or procedure? 3. What will this treatment realistically do for me? 4. How many treatments will I need to see results? 5. What kind of things can I do after the treatment to keep up my results? Got questions? We have answers at Silk Touch Med Spa! Thighs can be one of the toughest areas to slim down, especially after losing a substantial amount of weight. Like many lipo cases, this patient came to us wanting to slim her inner and outer thighs. She was tired of the rubbing in between the inner thighs – and was ready for her pants to fit perfectly on both her waist and thighs. Living with a pear shape since a young age, she was ready for a change. 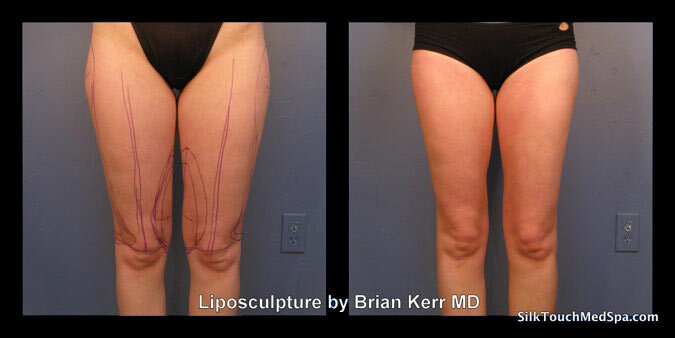 Dr. Kerr used liposculpture to reshape the inner and outer thighs. This unique approach smooths out legs by removing fat – giving an over all shapelier, firmer and younger looking legs. This non-invasive liposuction can also help diminish the appearance of cellulite. When both inner and outer thighs are treated, Dr. Kerr can address the fullness under the buttocks to create not only attractive legs, but also improving the look of the buttocks. Liposuction for the inner or outer thighs is a quick in-office procedure, with minimal downtime. Most patients return to normal activity within 3 days. The end result? Less jiggle, better-fitting clothes, and firmer thighs. We love PDO threads in the face. They can provide a subtle lift to the lower face to reduce jowls and smile lines. They provide lift to the cheeks, reduce wrinkles above the brows and even add more definition to your lips. st popular below-the-face requests include the area under the chin, which can be tightened with the suture technology, and the neck, which can be lifted. Injectors and Doctors are also starting to use threads to subtle lift lax breasts as well as skin above the knees and on the upper arms. Because these threads increase collagen production, it can be a great alternative for tightening on the arms and knees (for the right patient). Not everyone's skin or beauty goals make them the right candidate for this treatment. It is important to go to a Doctor experienced in thread lifts, as this is an advanced treatment which potential side effects when inserted improperly. 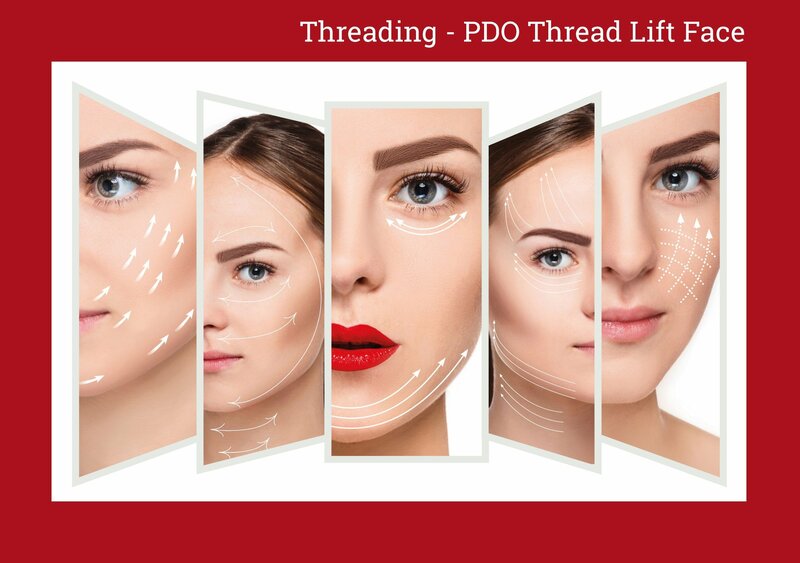 Want to learn more about PDO threads? Visit our website page here. Ready to get started? Request a complimentary consultation today. Will Botox Make My Wrinkles Worse? Wrinkle relaxers like Botox, Dysport and Xeomin are the most popular treatment choices for those looking to reduce wrinkles and keep a smooth forehead. However, there are a lot of misconceptions and myths about this product. One concern or questions patients may have is - Will Botox make my wrinkles worse if I choose to stop treatments? 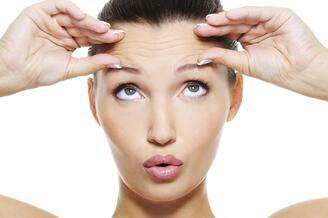 Botox or any neurotoxin will not make your wrinkle worse should you choose to stop treatments. Your features will return to exactly how they were before starting Botox treatments, and the natural aging process will continue from there. Movement will also return to normal. Botox treatments need to be repeated ever 3 months to maintain optimal results. Is your wrinkle relaxer not lasting like it used to? Talk to your provider about what your proper dosage is for maintaing results as long as possible. Ready to get started with Botox? Our expert injectors are among the top providers of Botox in the northwest, injecting more fillers & neurotoxins than anyone in the state of Idaho! In the hands of experts, you'll never leave looking phony or fake. Are you noticing wrinkly or loose skin under your arms or near your elbows? Why does it seem like the underside of our arms gets saggier/creepier skin than the rest of our skin? For women, one reason why it’s so apparent on the undersides of the arms is because of the hormonal changes after menopause. A drop in estrogen leads to less collagen production - which then thins the skin. Also if you have lost weight in your arms recently, thin skin becomes more noticeable in addition to laxity. 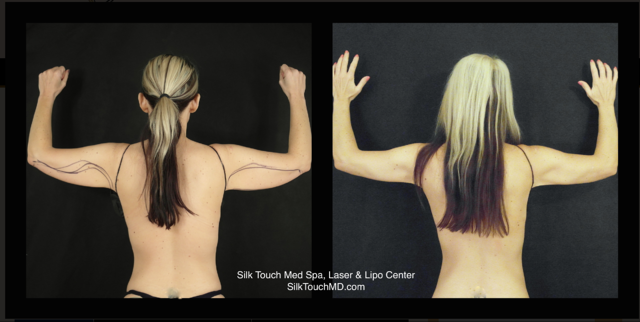 At Silk Touch, we have a few skin tightening treatments from lasers to surgical. However our favorite treatment for the area under the arms is ThermiTight. Thermight helps tighten the skin and incite new collagen growth. 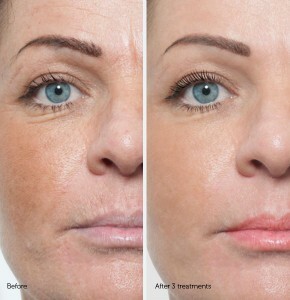 ThermiTight is an injectable RF treatment. During a minimally invasive procedure (often paired with arm lipo) radio frequency energy is delivered under the skin through tiny probes (you're numbed so you don't feel anything). The treatment takes a few months to see full results as it has to jump start your collagen production first. Only one treatment is needed for optimal results. Thermitight pairs great with liposuction as it can be done during the same procedure without adding a lot of time to your procedure, and no additional recovery time. Ready to get started with your transformation? To schedule a complimentary consultation click "schedule" below or call us at 208-939-3110. When it comes to new treatments - it's one of the first things we want to know - does it hurt? What will it feel like?It can be nerve wracking getting any new treatment, especially when you have no idea what to expect. Microneedling is one that sounds a lot scarier than it actually is (it's not like "needling" sounds relaxing) The big question we always get is- Does Microneedling hurt? Does Microneedling Hurt During The Treatment? The answer? Yes, WITHOUT numbing. But luckily with topical numbing cream the treatment is much more comfortable and at the worst mildly uncomfortable on more sensitive areas. Microneedling feels like a deep exfoliation, a little like sandpaper. It can also feel tingly/tickly from the vibrations of the needle. Another thing that affects the pain tolerance is how DEEP or aggressive the treatment is. Microneedling depth is adjustable based on your skin type & overall treatment goals. More aggressive treatments are more painful, and have longer dowtime. But on the other side you results quicker and can treat more stubborn texture issues like scarring. What does Microneedling feel like after your treatment is over and the numbing wears off? After a Microneedling treatment your skin will feel a little sensitive and tight, similar to a sunburn. Depending on the depth of your treatment, most redness and sensitivity disappears within 24-48 hours. With more superficial microneedling treatments patients can expect redness to disappear by the end of the day. It's important to follow all post-treatment protocols given to you by your technician. This will help your skin heal faster as well as maximize your results. Ready to get started? Schedule a complimentary digital Visia Skin analysis with us today!